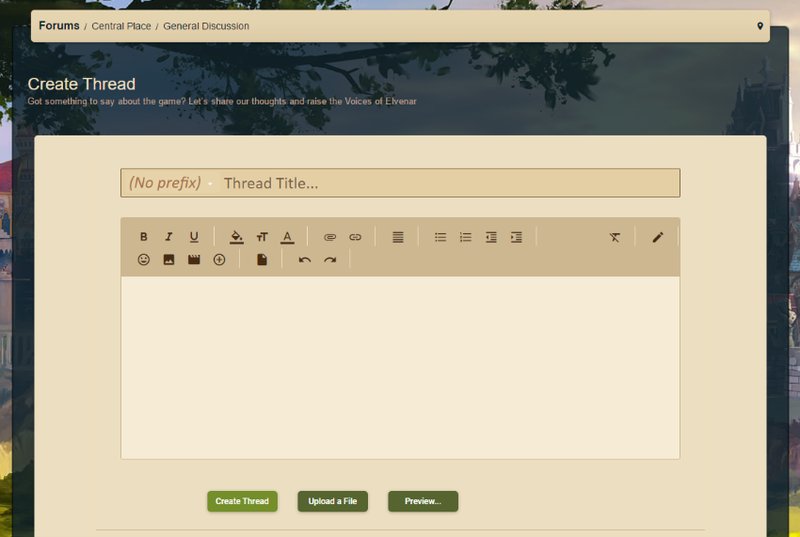 In this guide we will cover the basics of creating posts and threads on the Elvenar forums. This guide will help you with your first steps on our forums, and will help you fill at home in our community. In case you have any questions or comments on this guide, please feel free to send us your feedback via the button at the bottom of the page. All you'll still have to do is click the box to start typing your message. When your message is finished, you can click the 'Post Reply' button to save your reply. It will then be immediately posted to the forums, where others can read it. Below you will see screenshots of the forum overview. In the bottom right of there, you will find a green button with a white + on it. To create a new thread, click this button. After you've clicked it, you will see the following overview screen. Here you will have to enter your thread title and define the text of the first post of the thread you're about to post. When you are ready, click the 'Create Thread' button at the bottom to post your thread. It will now be available for everyone to see, and other members can comment on it, too. Be sure to check back to see what others write in response! We hope that you found this guide useful, but of course we don't know if that is indeed the case until you let us know! You can share your feedback below by clicking the green button - thank you for sharing in advance, and welcome to the Elvenar forum community!